*but only because we now say it’s acceptable. I think the problem here too is calling it an afro. The picture posted is NOT an afro. A true afro can only be achieved on ‘afro textured’ hair, ie coarse strands ie black hair. Pictured above is a twist out or tight wand curls, certainly not an afro. 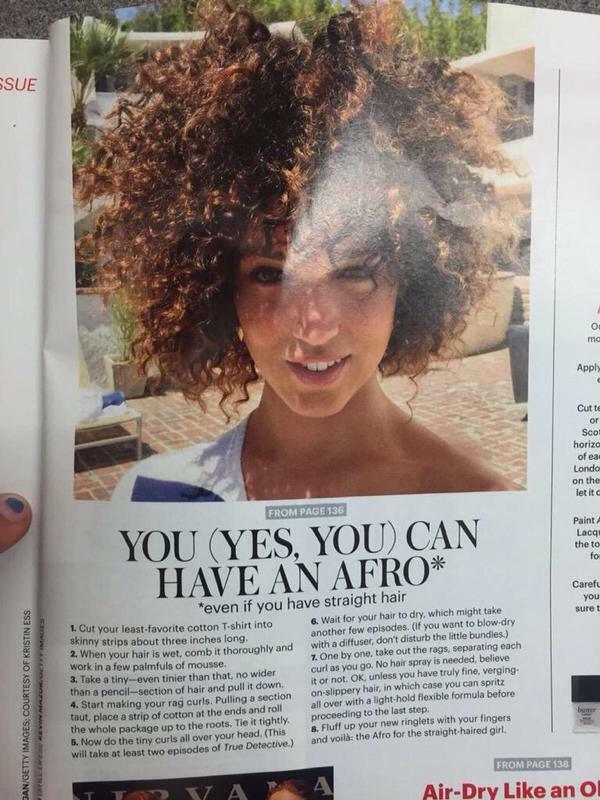 If Allure wanted to celebrate the ‘new afro trend’ why not feature a black model? Why not speak to their black audience (we can assume it’s small but regardless) and show techniques on perfecting our look. How about featuring a natural hair model and say this is the desired look they were trying to emulate, because…isn’t it? What do you think? should we be happy they are finding beauty in our look? do you think it’s the same as when black women straighten our hair?